The small, compact village of Dailly (NS 270 014), formerly associated with coal mining, forms the centre of an area which is extremely rich in bird life. Much of this is due to the variety of habitats found nearby. The floodplain of the River Girvan forms the foundation for both mixed, largely pastoral farming to the north-east of the village, and the Brunston Golf Course to the south-west. Now and then the valley contains rich little pockets such as reed-fringed ox-bows near Dalquharran Castle, whilst the mature, broad-leaf woodland towards Bargany Estate, slightly farther to the south-west, is well worth inspection. On a bus route, this whole area is easily accessed, whilst cyclists will find the roads on either side of the valley relatively quiet, especially the B741 on the north side which is part of the National Byway cycling network in the area and connects with National Cycle Route 7 near Maybole. Still to be assessed, further details to be posted on the website in due course. Waymarked byway network in valley connects to National Cycle Route 7 near Maybole and to Girvan. As one might expect with such a varied habitat, the range of birds seen in this area is considerable, The flood plain hosts Whooper Swan occasionally in winter, while the ox-bows give shelter to both Grasshopper and Sedge Warbler , along with a healthy population of Reed Bunting . 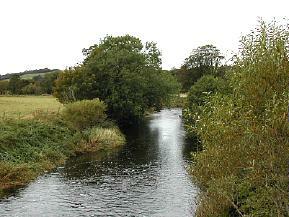 Below Dailly, the Golf Course regularly hosts a hunting Barn Owl or Buzzard , while the river itself has breeding Common Sandpiper, Kinfisher, Dipper, and Grey Wagtail , with Goosander appearing mostly in winter. The woodland areas are the real gems though, with a good summer population of typical species such as Great Spotted Woodpecker, Redstart, Blackcap, Garden Warbler, Chiffchaff, Wood Warbler, Pied and Spotted Flycatcher and Jay. Here the raptors like Sparrowhawk and Buzzard predominate, with Raven often heard overhead. A wide range of species have occurred in this part of South Ayrshire and rarities include Honey Buzzard, Osprey and Hobby . Ayrshire Paths is well advanced in the process of establishing a network of way-marked trails radiating out from Dailly. These are due to open in autumn/winter 2002. An interpretive leaflet will be available from information centres or can be downloaded from their web site.